In 1966, Dave began teaching Choy Lay Fut kung fu on the west coast of Australia, in the city of Perth. He held classes in the upstairs section of a large old boat shed down by the river. The training was very hard in those days so in the first few years only small groups of hardened students ever passed the grueling initial stages of training that separated the strong from the weak (from 1966-1971). In 1970, during a cordial visit to a karate school with several of his students, the chief instructor there made the mistake of asking Dave for a (karate vs. kung fu) sparring match. The stout 3rd dan black belt instructor obviously wanted to show off to his students. Dave obliged and the match ended in defeat and humiliation for the karate fighter who proved he was no match against Dave's deceptive fighting techniques. The existence of so many different styles and systems of martial arts today has led people to ask the inevitable question, " Which is the best style or form of martial arts?" To this Master Lacey replies- "The style that you feel is best suited to your abilities, personal needs, and fulfills your expectations. For me, Choy Lay Fut is the martial art that has given me the greatest satisfaction and therefore it is the martial art style that I love most- so for me personally, Choy Lay Fut is the best as far as the Art of fighting is concerned. Choy Lay Fut has given me more than just cultural martial arts knowledge. It also gave me the spiritual enlightenment and philosophical wisdom that has helped me throughout my adult life. Everyone has their own personal preference as to what type of martial arts they want to take up and why they want to do it. Any self-defense system or fighting art is only as good as the person behind it. The effectiveness of an offensive technique depends on the speed, timing and precision of the move when executed. Sharp reflexes, nerves, wit, confidence as well as one's physical condition and endurance all play an important part in one's ability to defend oneself. Unfortunately many martial arts practitioners have the illusion that no one can beat them in a fight, thus underestimating the skills and prowess of other experienced fighters. The one important thing any competent martial artist should always keep in mind, is that no matter how good you think you are there's always others who can beat you!" In the many years he devoted to teaching kung fu in Australia (1966-1995), Master Lacey saw many of his students winning awards and championship titles in numerous national and international kung fu and kick-boxing tournaments. At the 1982 World Chinese Martial Arts Championships Tournament hosted in Hong Kong the crowd gave him a thunderous ovation when Master Lacey's name was announced and he stepped into the arena to perform the "Drunken Eight Immortals" form. It was obvious the local people remembered the name of the Black Panther of Choy Lay Fut who had won fame and recognition in Hong Kong 21 years ago. 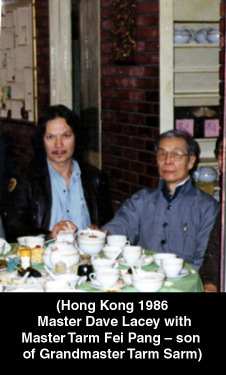 During his stay in Hong Kong, his old time rival Sifu Wong Shun Leung ( Bruce Lee's Si-hing and instructor under Grandmaster Yip Mun) contacted Dave to invite him to a small private dinner banquet in his honor, attended by several other kung fu masters including Master Lee Koon Hung and his student Tat Mau Wong. In May 1985, Master Dave Lacey officially named his school, "The Buck Sing Gwoon" in honor of Buck Sing Choy Lay Fut founder Grandmaster Tarm Sarm and his school. (Tarm Sarm died in 1941). Tarm Sarm's son Tarm Fei Pang is very proud Master Dave Lacey carried on the name of his father's school. After living in Perth , W. Australia for twenty-three and a half years, Master Dave Lacey felt he needed a change and decided to move to the bigger and more exciting city of Melbourne in the state of Victoria where he intended to set up his new school to teach and propagate Choy Lay Fut kung fu. He left his trusted student Franco Riggio (3 times Australian National Kung Fu Full Contact Champion and undefeated in 15 kung fu and kickboxing tournament matches) to run the school in Perth. Undaunted by the larger number of kung fu schools already existing in Melbourne, Master Lacey re-established his school the BUCK SING GWOON in 1989 in the suburb of St. Kilda. 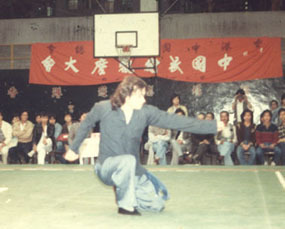 Because of the good location of the school and his well known reputation in the Australian Chinese Martial Arts circles, it soon attracted the attention of martial arts enthusiasts seeking to learn Choy Lay Fut kung fu and train under Master Lacey including a number of disgruntled top students and instructors from another kung fu school. Missed by his students in Perth, several of them took the initiative to move to Melbourne to be with him.